A far, far cheaper way of cruising than buying into the Harley dream. Reliable too. The VN1500s are positively vast so, if road presence is important to you, they could be your thing. Lots of gutsy, low down performance with smooth touring speeds at the top end mean relaxed, joyful and easy riding. Soft, plush… Like sitting in a pile of cushions. The suspension’s ok: nothing too sharp or soggy going on, whilst the handling’s predictably slow for a bike of this style and weight (although it’s more forgiving than it looks). The single front disc could do with a twin but the VN’s surprisingly low on vibes, which is a treat. 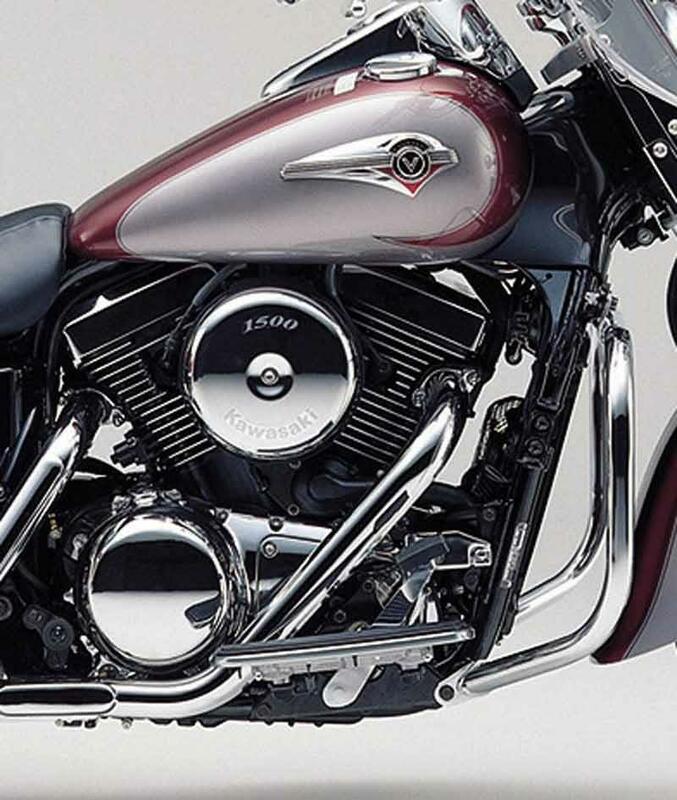 A rubber-mounted, v-twin, oozing with thunderous torque, it hauls this heavyweight around with a seeming lack of effort. Low down grunt is what’s required on a cruiser and the VN’s got it in spades. At higher speeds it copes well, cruising happily at around 80mph. Delivery is smooth and laid-back. In all, the bike/engine was running in various guises for around sixteen years, so something must be right with it. More reliable than its American counterparts, the VN rumbles on and on. Finish is very good. 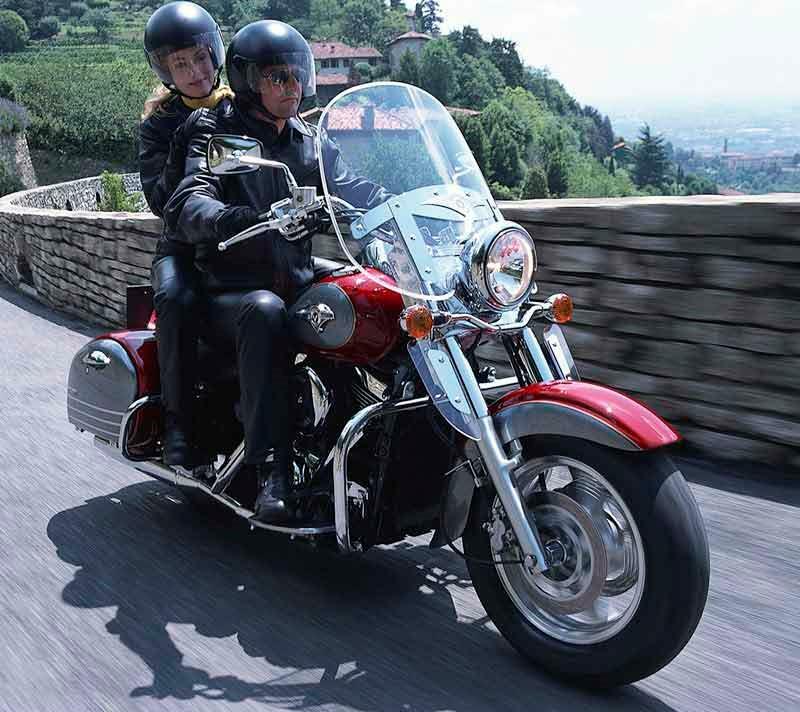 Recalls on some early (1997) bikes were for electrical failures and transmission problems. The VN1500 (they’re sometimes called “Vulcans”) did and does represent a ludicrous amount of bike for the money. 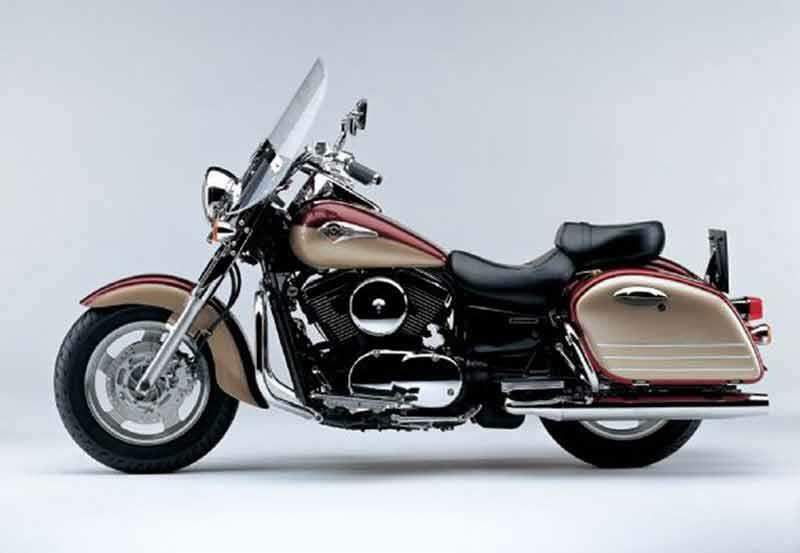 Even when new, it held its own amongst starrier counterparts (Yamaha’s Royal Star and various Harleys) on the road whilst offering great value which they hold pretty well, even now. Find a Kawasaki VN1500 for sale. The tank-mounted dash is fairly basic, but looks the part, plus wide bars, a low seat and plenty of sleek chrome round it off. Shaft drive is definitely a bonus as you’ll have your work cut out, cleaning all those shiny bits. Early bikes lacked fuel injection and the five-speed gearbox. 1996: VN1500 Classic launched, updated from an earlier version dating from 1988. Six months later (November 96), it gets revised gear ratios, single valve springs and a new oil pump. 1998: A significant update. There are suspension modifications and the bike goes from a 4- to 5-speed transmission. 2002: The Classic becomes the “Classic Fi” as fuel injection is added. The model is discontinued in 2004 as the VN1600 takes over. 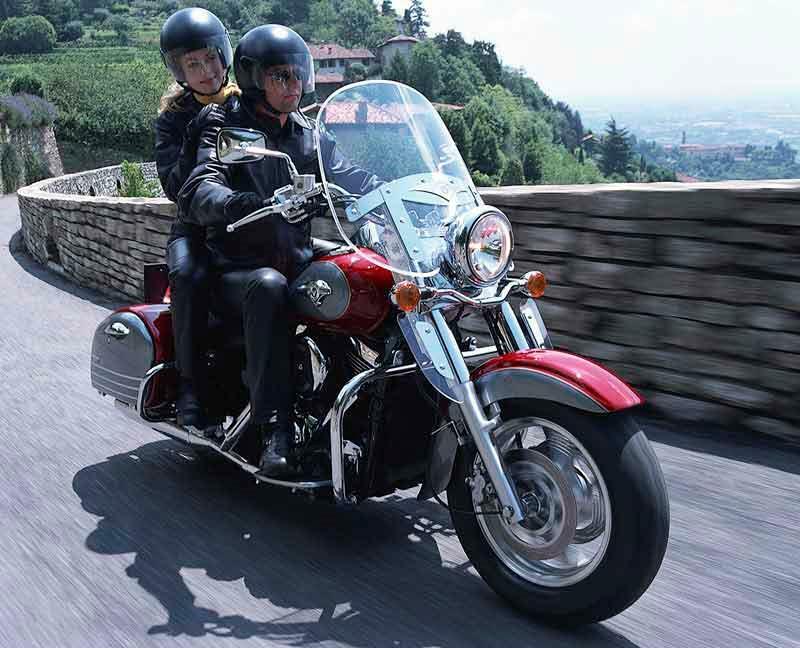 VN1500 Classic Tourer: Based on the standard model, the touring version had cast wheels, a wider front tyre, a new exhaust, an adjustable windscreen, new footboards, hard luggage and more chrome! Ran from 1998 – 2003. 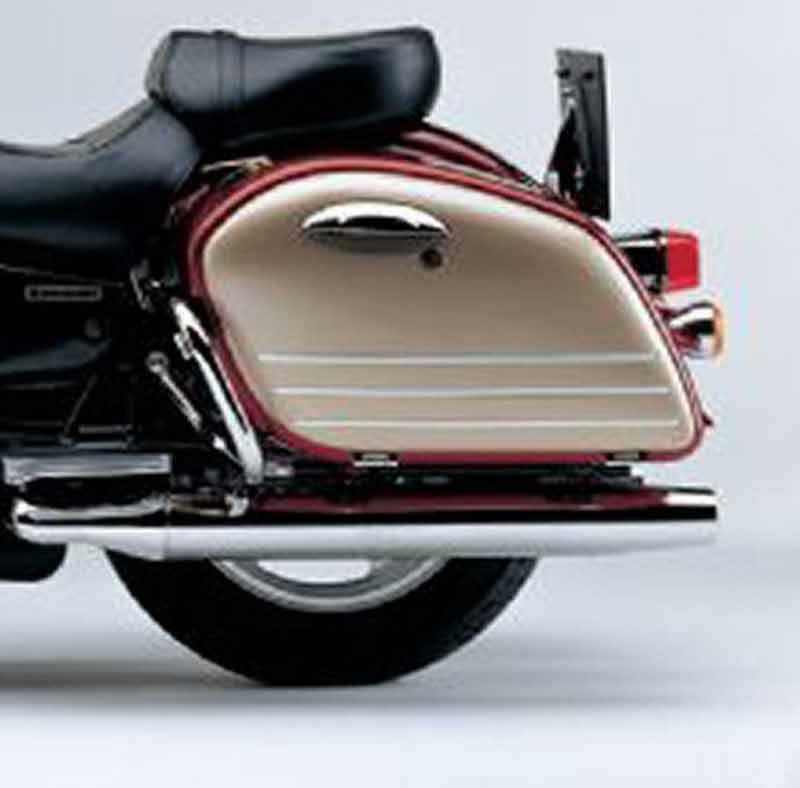 VN1500 Drifter: The first VN1500 to get fuel injection (in 1999), the Drifter had a definite 1940s look about it with acres of bodywork in a theatrical, cruiser design and a single, saddle-style seat. Single front disc. Ran from 1999 – 2004. 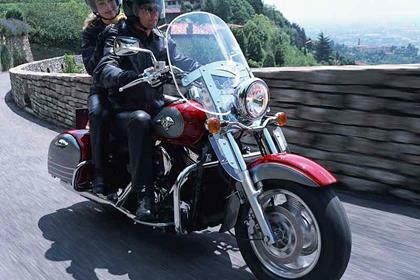 VN1500 Nomad: Based on the standard bike but with screen, panniers and twin front discs (it needed them: it weighed in at 337kg). It also had fuel injection. Ran from 2000 – 2002. 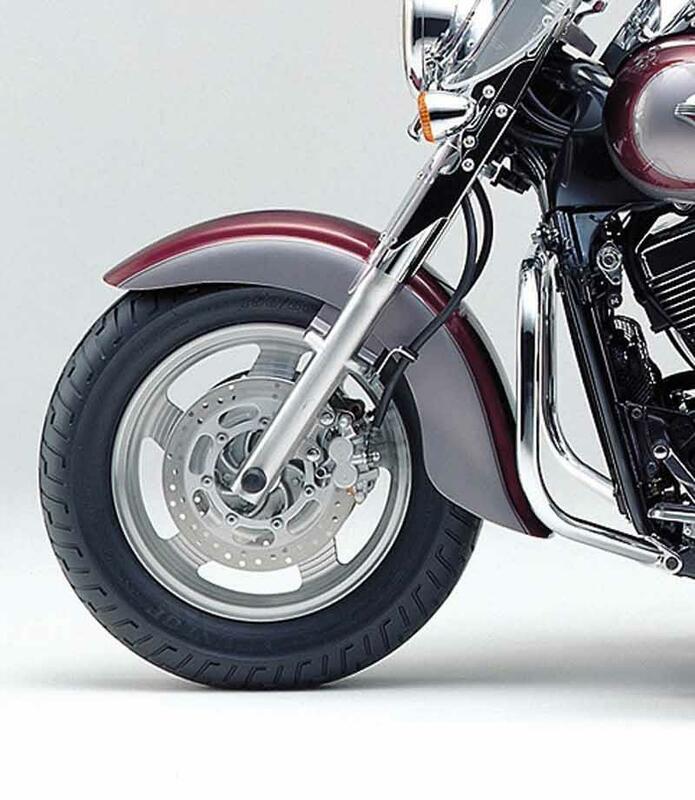 VN1500 Mean Streak: A low-rider version with slightly more horsepower (71bhp), a bit less weight (289kg), twin front discs and bigger, 43mm forks. Ran from 2001 – 2004. 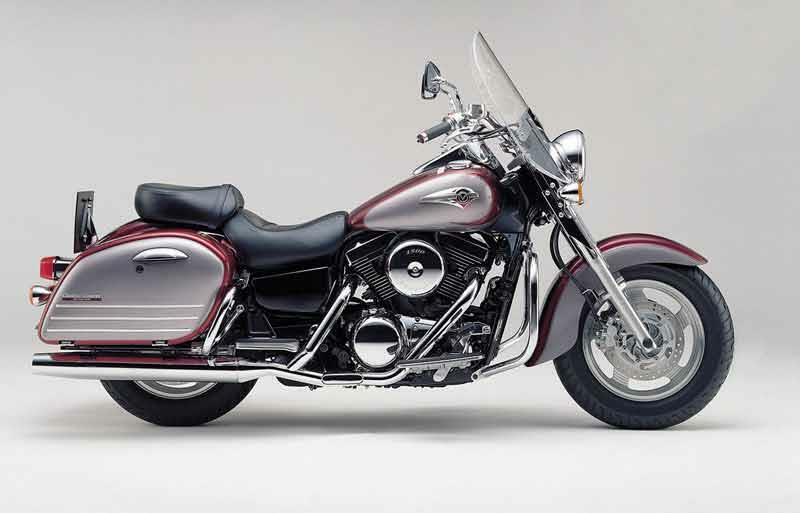 4 owners have reviewed their KAWASAKI VN1500 CLASSIC (1996-2004) and rated it in a number of areas. Read what they have to say and what they like and dislike about the bike below. Minimal maintenance, really comfortable easy handling at high or low speed, floats down the road, proper throttle application and it eats up twisties pretty good for a cruiser. Good recommendation. 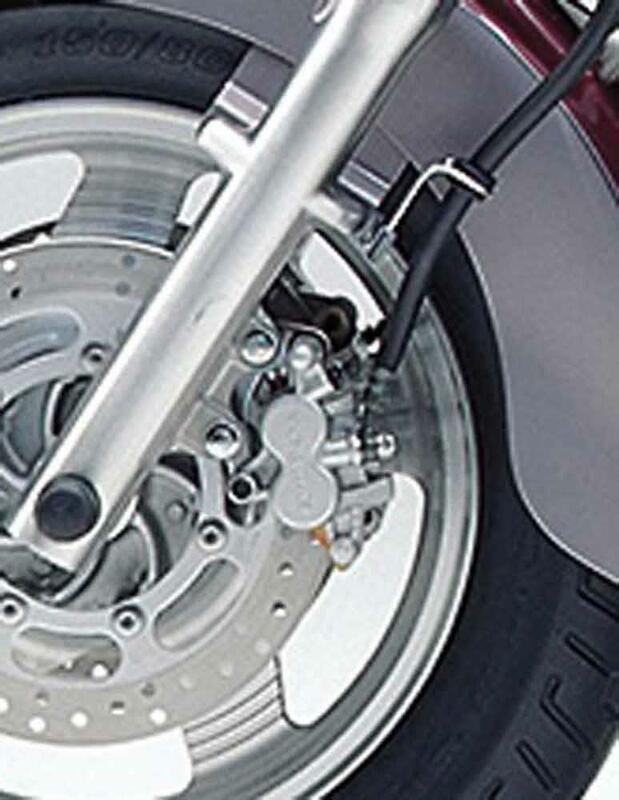 Single front disc, rear drum, pay attention and don't be stupid the brakes are good enough. Great for highway cruising, good in the mountains (where I live), twisties ok and fun, scrape the floorboards no problem-gas on it, not so great on dirt roads but ok. Need gas before get tired. Cruiser with cruiser power delivery, no complaints, didn't buy a racing machine. When the EPA had MTBE taken out of gasoline and replaced with 10% alcohol mileage went from 43 to 40 mpg and bike decided it preferred premium instead of regular. Alcohol softened rubber tip of float valve and it stuck wide open, replaced valve and seat and all gas lines with newer materials in 2015. Runs like a dream. Rest of bike is near flawless, no rust or pitting, garage kept. Original 600 mile service at 600 miles by a dealer. Then a local guy does the rest, 1 front tyre, 1 rear tyre, a handful of oil and filter changes, plugs once, coolant once, air filter once, carb work once. I'm cheap, this stuff doesn't get done every year. Total for maintenance and repairs in 14 years under a thousand US dollars. Floorboards, love them, luxury item. Added a windshield, saddlebags and radar detector. Dealer, 10,500 on the tag, dropped it to 9400, traded a 12 year old Intruder, 8k on the CC and out the door, windshield, bags, crash bar included. Kawasaki's take on the real deal, has all the Cons of the real deal. Bought in a flurry. Entertaining for the first week. Bland, bland, bland. Not enough going for it to overlook the flaws. A single disc on a 300kg machine? Caliper lacks bite to boot. Hoses aren't braided. Kawasaki Heavy Industries could have improved on the H-D breed but copied the formula in every respect to the detriment of the bike. Handling is....OK for a barge. You have to take these things in context - she's a long, long bike. Nice wide sweepers are more this bikes forte. Mini roundabouts less so. But that's to be expected. You would have thought there'd be spades of low down and mid-range torque in a 1470cc twin! Not so, really. Mid-range was OK. Not impressive for the size of the engine. And being a big twin, it ran out of puff at 5k rpm....So it was a bit duff really. And then we get to the gearbox. Only 4 gears, 1st was really low, but 2nd and 3rd were much higher so it was quite a jump from 1st to 2nd and 3rd which was annoying as hell around town. And there was the "positive neutral finder" - which made shifting from 1st to 2nd a two prod action as there was no way to shift through neutral without it being engaged. Frustrating. The most efficient bike I've ever had - as in: the most efficient way to turn fossil fuels into sound with movement as a mere by-product. They are a lot of engine, so they will always be worth a bit of money so minimal depreciation saves the day. About 35mpg out of mine. The main reason I bought it was everyone told me the state of NZ roads was terrible and I had to take it easy. So I bought a comfy, shaft driven, easy going bike (this bike). Clock mounted on tank is stupid - you have to keep glancing down to see it. And the clock lights aren't very bright at night. And having the clock on the tank means you can't have a tank bag! Chrome is the cheap flaky variety. Leather saddlebags look a bit Village People, young man. And aren't waterproof. But at least they are there. So it was for sale at 9000 NZD (Bikes are expensive here). I knocked it down to 8000 NZD, about 3600 GBP. It had Vance and Hines kit, a known service history, lowish mileage, bought from a local dealer (with a duff battery who wanted me to pay for it (MotoMart, Lower Hutt). Sold it 18 months later for 2k NZD less privately. Which isn't a big loss, really. This bike is so comfy, have been on many long trips. IE, Oregon to Sturgis, glacier park, Yellowstone....etc. it's like cruising in a Cadillac. I'm a woman about 5'4" and I am flat footed at a stop. Very easy to handle almost drives itself. I love my bike! I bought it used. And it was a great experience. Great bike, the weight and power took alot of getting used to but a joy to ride when you get to grips with it. The panniers hold loads of gear, the acceleration off the line is superb. the bike does move around alot in the wet so you need to be really smooth also the tank range is not great for a touring bike. Riding position is sooo comfortable you can go for hours on end. Wouldnt trade this bike in for the world. its a definite keeper. Why is my Kawasaki VN800 Classic not starting?